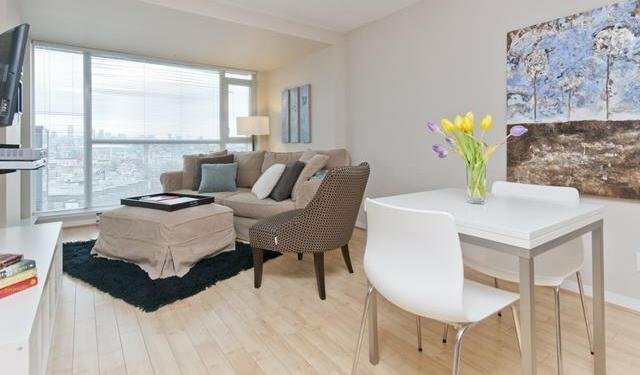 Breathtaking North Shore Mountain views abound in this chic 1 bedroom and den suite in The Stella which is at the centre of vibrant Mount Pleasant. This open plan contemporary layout begins with gleaming light stained laminate flooring, a high end kitchen featuring s/s appliances and Corian counter tops over-looking the generous sized living/dining room all oriented towards the spectacular views. The large master suite has an abundance of smart custom designed cabinetry to keep everything in it's place. To enjoy the views, the suite opens to a private entertainment sized 10' x 10' patio! In suite laundry, parking and a full functioning gym over looking the common patio completes the package. Perfect!